Growing a full sized baobab tree is not for the faint hearted, especially if you live in a northern European climate. Without a large, heated greenhouse, or better still having the resources of Kew gardens in your pocket, then you could be setting yourself up for failure! Why? Because unless you can reproduce an appropriate tropical climate, near equatorial light levels, and minimum winter temperatures of 15 degrees Celsius or higher, your germinating seedlings are never going to see out the year! Of course, there is another way of looking at it. If you want to grow your baobab tree as a houseplant or bonsai then things suddenly growing one become a lot more realistic and far, far easier. 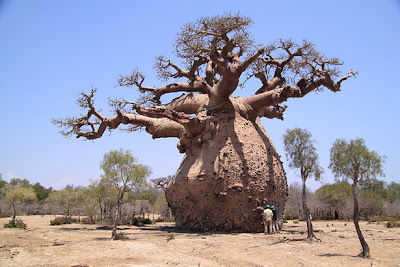 That being said, if you are lucky enough to live in a country where the climate can supply most of what a baobab tree needs to survive, then the chances are that with a little bit of environmental' tweaking' you will be able to succeed in growing your very own baobab tree with very little effort. All you need now is an elephant! 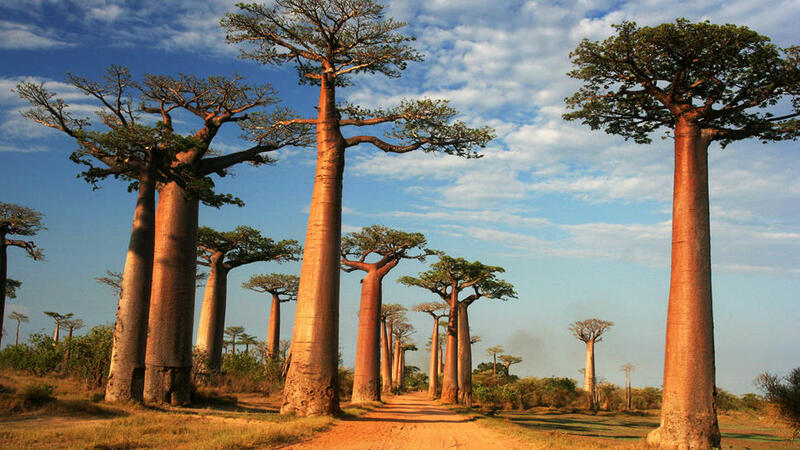 Baobab trees are conspicuous in their native landscape, standing like sentinels in a challenging and 'resource poor' environment. And there is a reason for this. Water is scarce and the last thing that a baobab tree is another baobab tree growing right next to it competing for such a precious commodity. 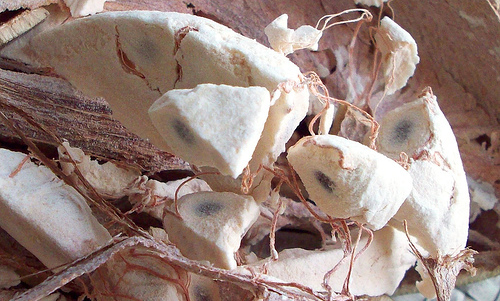 So it turns out that the baobab has a trick up its sleeve - the baobab fruit! The baobab fruit has a rich, velvety, yoghurt flavour with a hint of sherbet, and now we get to the point where the elephant comes in. They are quite partial to baobab fruit and as the seed from the fruit spends the next 4-5 hours passing through the elephants digestive tract, the seeds tough coat is slowly broken down by the hot stomach acids. Eventually the baobab seeds are deposited some distance away, ready to germinate, and packaged in a very convenient blob of steaming fertilizer. Of course, not everyone has a spare elephant handy and so you will need to replicate the digesting process as best you can. Typically soaking baobab seed in hot water for 24 hours will do the trick. You can cheat a bit here by rubbing the seed with sandpaper or a nail-file to reduce the thickness of the seed coat. Only scrape enough of the baobab seeds to expose the inner white layer, do not go any deeper. After they have been soaked they will then need to be dried for another day or so before planting. The germination rate for baobab seeds can be low, slow and sporadic so sow two to three times the amount of seed required to ensure you get enough stock. Be aware that it can take 3-4 months from your first Baobab seedling to germinate until your last one pokes its head above the compost. It is imperative that you use a very well-drained growing medium. You can use a standard seed compost - such as John Innes 'Seed and Cutting' but you will need to mix in an equal part of horticultural grit or perlite to improve the drainage further. In order to germinate the baobab seeds the soil temperature will need to be kept at between 15 and 19 degrees Celsius, so unless you are blessed with these temperature naturally you will need to keep your compost - presumably held in a seed tray - in a heated propagator. Planting seed approximately 1/2 in. deep in the compost and water well using warm water. 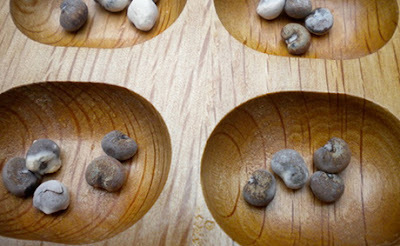 The seeds can now be moved to a sunny position. Considering the baobabs natural environment, they will need as much light as possible. Only water again when the growing medium is barely moist to the touch. Even then, do not soak them. Half water them, keeping the seeds barely moist as baobab seedlings are very prone to root rot. Please note that once the seedlings show through the compost, do not attempt to remove the shell covering. Transplant the seedlings when they are large enough to handle into 3 inch pots, again using a very free draining compost. You can pot on as required into 5 inch and finally 8 inch pots. Always remember that the Baobab will require as much light as you can provide and may even benefit from supplemental lighting. Furthermore, absolutely no water must be given to the tree during its dormant period in the winter months or it will rot and die. If it is warm enough for you to overwintering your Baobab outside then it will need to be under protection from the rain - just make sure that it is fully ventilated to prevent fungal rots. Make sure that winter temperatures do not drop below 10 degrees Celsius. If this is likely then the Baobab will need to be brought in under temperature controlled protection such as the sunniest room in the house or a heated greenhouse.